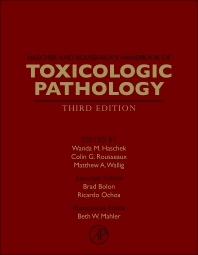 Haschek and Rousseaux's Handbook of Toxicologic Pathology is a key reference on the integration of structure and functional changes in tissues associated with the response to pharmaceuticals, chemicals and biologics. The 3e has been expanded by a full volume, and covers aspects of safety assessment not discussed in the 2e. Completely revised with many new chapters, it remains the most authoritative reference on toxicologic pathology for scientists and researchers studying and making decisions on drugs, biologics, medical devices and other chemicals, including agrochemicals and environmental contaminants. New topics include safety assessment, the drug life cycle, risk assessment, communication and management, carcinogenicity assessment, pharmacology and pharmacokinetics, biomarkers in toxicologic pathology, quality assurance, peer review, agrochemicals, nanotechnology, food and toxicologic pathology, the environment and toxicologic pathology and more. Scientists, including pathologists, toxicologists and graduate students, in academia, industry and government. Potential settings include biopharmaceutical, medical device, and chemical companies; contract and basic research organizations; veterinary diagnostic laboratories and medical forensic laboratories.